The destination reached by this hike/climb affords some of the best views in the Santa Catalinas. The relatively modest elevation of Peak 5001 is overshadowed by nearby Gibbon Mountain, McFall Crags, and Rattlesnake Peak. Even Thimble Peak, a few hundred yards to the Northeast, is over 300 feet higher. Judging by the lack of disturbance along Saddleback ridge and the infrequent sign-ins on the register, this area gets little attention. Once you leave Phoneline Trail and until you reach Point 4409 (the end of the Blackett’s Ridge Trail out of Sabino Canyon, you are likely to have this hike to yourself, even on the busiest days of the year. 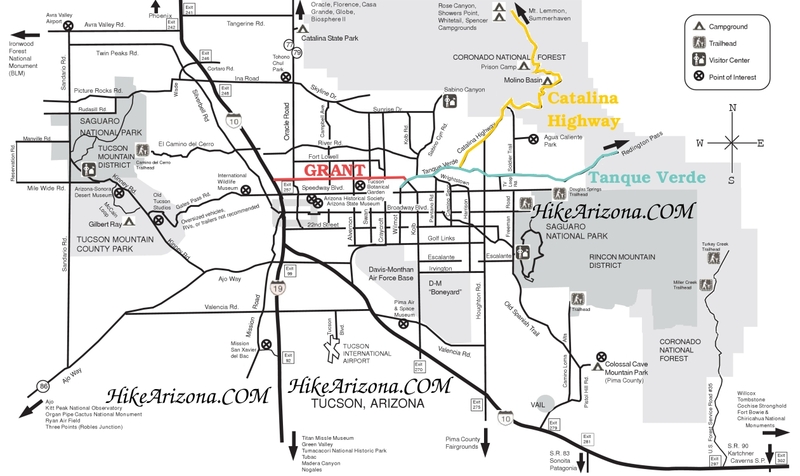 This is a loop hike out of the Sabino Canyon Visitor Center (SCVC). The all offtrail hike described here is from the point you leave the Phoneline Trail until you reach Point 4409, which is the culmination of the Blackett’s Ridge Trail. In practical terms, to complete this hike, you would start on Phoneline Trail from SCVC, complete the portion described herein, and return to SCVC on the Blackett’s Ridge Trail. 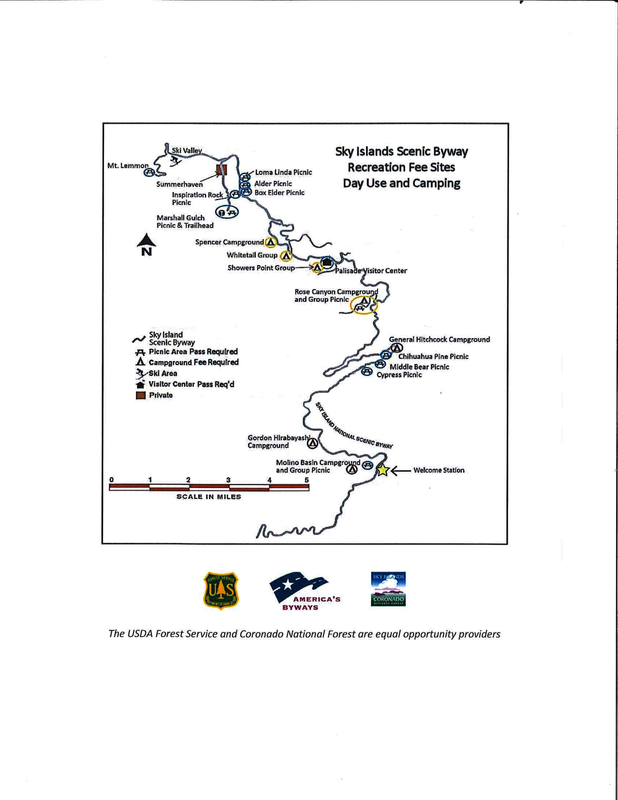 Your planning for doing this hike should include the additional 4-5 miles RT distance and 600+ feet of elevation gain for parts of those well-marked and well-used SCVC trails. Hiking clockwise is recommended since it presents the most difficult scrambling parts as uphill climbs. The fun begins when you leave the Phoneline Trail and bushwhack up the obvious drainage to Saddleback. You can make your way up the drainage or to the left of the drainage; however, it is much easier going to the right (southwest) side of the drainage. Your progress up the 600 feet or so up to the lowest part of the saddle is helped by friendly vegetation (i.e., few cats claw and cacti) and nice flattish mossy areas which make it more like climbing a stairway. There are some steep areas and scramble-arounds, but nothing like the left side or the actual drainage. At the saddle, you now have great views northwest and southeast, and you may see some people on the end of the Blackett’s Ridge Trail 400 feet above you. But, your focus now is to turn left (east-northeast) to the first of several false summits that have to be climbed in order to reach Peak 5001, which is net 1000 feet higher than the saddle. There are no serious scrambling obstacles along here but the footing is so-so in some steep areas. Take time along the ridge to enjoy the magnificent rock formations along the way. Near the peak, look off to your right (east) and spot the unique “diving board.” See the pictures for a better understanding, but the feature is a 8-10 feet long by 2 feet wide protrusion of rock that has a lot of air under it. It is reminiscent of the Trolltunga rock formation in Norway (https://hikearizona.com/photo.php?ZIP=594970), but much smaller. Needless to say, it takes a fearless soul to stand out there; only one of our group of four did it. Just past the large cairn that marks the top (and the location of the sign-in register) is a great place for lunch. Despite the gusty day on our visit, the air was crystal clear. To the north is an incredible view of Thimble Peak and Kors Wall to its left, to the east is Bear Canyon and Gibbon Mountain, to the west is Sabino Canyon, McFall Crags, Rattlesnake Peak, and Cathedral Peak. You won’t want to leave this spot, but…. I recommend doing this hike in clockwise fashion. That sets up the riskiest part of the steep terrain (which is from the saddle to the summit of Point 4409 – the terminus of the Blackett’s Ridge Trail) as an up-climb, as opposed to a down-climb. It’s nearly always easier to find foot placements when climbing up-climb.